When you have people tagged in Photoshop Elements, you can easily click the People tab at the top of the Organizer and locate all the people you have tagged. Elements also lets you search photos for visual similarities. You may have group shots, architecture, animal life, and so on and want to search for photos containing objects that are visually similar. To search for photos with visual similarities, choose Find → By Visual Searches, Visually Similar Photos and Videos, Objects within Photos, and Duplicate Photos. Choose Find → By Visual Searches → Visually Similar Photos and Videos. Choose Find → By Visual Searches menu and choose Duplicate Photos. Photos that are visually similar appear in horizontal rows. Notice the Stack button on the right side of the figure. Click Stack, and the photos are stacked. If you want to delete photos, click a photo and then click the Remove from Catalog button at the bottom of the window. 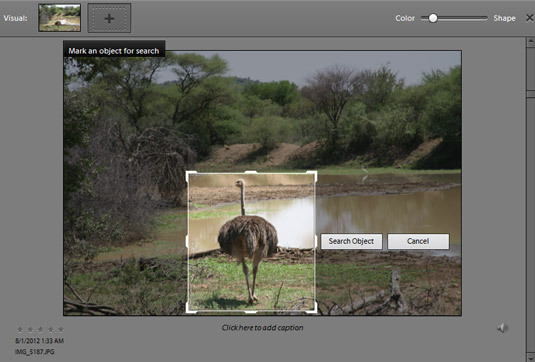 Search again and choose Objects within Photos from the By Visual Searches submenu. A rectangle appears for selecting a photo that contains the object you want to search. Move the rectangle and resize it so it surrounds the object you’re looking for. Click the Search Object button. Elements displays its search results. Mark the object you want to search and then click the Search Object button.